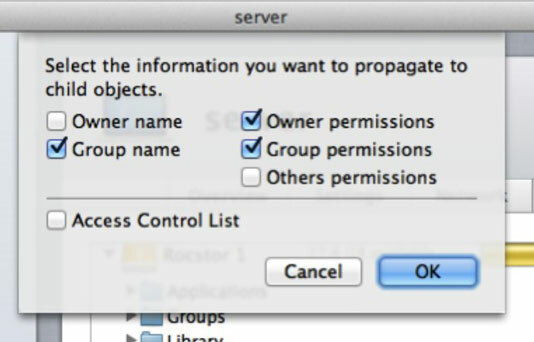 With either POSIX (standard) or ACLs permissions, you can manually propagate them down through a folder hierarchy in Lion Server. With POSIX permissions, you can choose to propagate the Owner, Group, or Others permissions, or any combination. With ACLs, you can propagate only a folder’s entire ACL, not entries for individual groups or users. 1Click the name of your server. You’ll find it in the sidebar under Hardware. Browse for and select the shared folder. 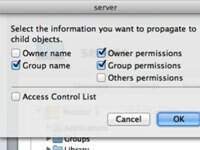 3Click the gear icon and select Propagate Permissions from the pop-up menu. The gear icon is at the bottom of the window. 4Select the propagation options that meet your needs. Choose the Access Control List check box on the bottom of the window to propagate ACLs. Select the POSIX permissions in the top half of the dialog. 5Click the OK button when done. There is no undo here. Make sure you’ve selected the right permissions before clicking OK.